Tourist Map of Barcelona, 49 important places for tourists. 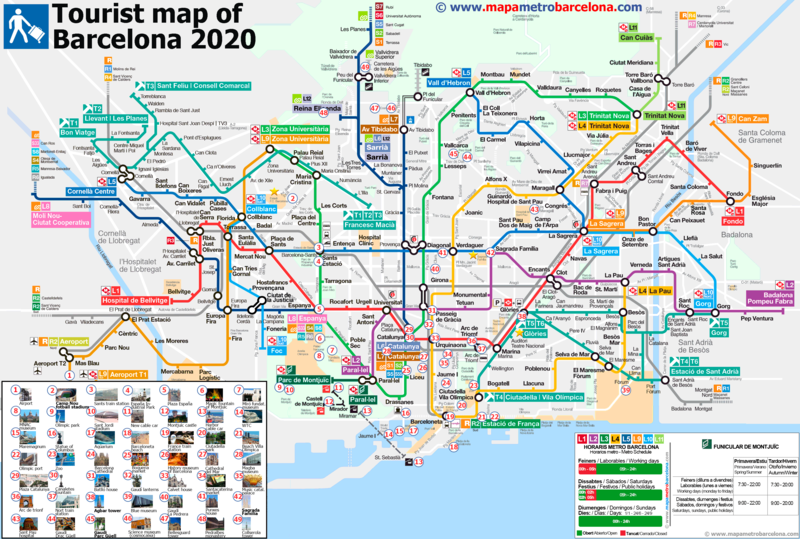 Below you will find the Tourist Map of Barcelona's, including the 49 important (or nice) places for tourists, and on the same map you can see new subway stations, new lines, and schedules. You can copy, print or do whatever you want, but is completely forbiden copy it on any other website, or direct links to the image. We have a PDF version of this tourist map of Barcelona, in super high definition (2 MB). We recommend click the image and download the PNG format for high quality and print the map in a A4 size paper (similar to american foolscap folio). 1.- Airport. 26.- History Museum of Barcelona. 3.- Sants Railway Station (RENFE-ADIF). 28.- Magba (art museum). 4.- España Industrial Park. 29.- Plaza de Catalunya. 6.- Font Mágica de Montjuïc. 31.- Casa Batlló. 7.- Fundació Miró. 32.- Gaudi's streetlamps. 9.- Olimpic Park. 34.- Santacaterina market. 10.- Sant Jord Palacei. 35.- Palau de la Música Catalana. 11.- Nwe teleferic of Montjuïc. 36.- Arc de Trionf. 12.- Castle of Montjuïc. 37.- Railway North Station. 13.- Teleferic of maritime port. 38.- Torre Agbar. 14.- WTC. 39.- Forum of Culturess. 15.- Maremagnum. 40.- The predrera. 16.- Statue of Columbus. 41.- Casa de les Punxes. 17.- Aqüarium. 42.- Sagrada Familia. 18.- Barceloneta beach. 43.- Hospital de Sant Pau. 19.- Railway Station of France. 44.- Drac Güell. 20.- Park of Ciutadella. 45.- Parc Güell. 21.- Vila Olimpica Beach. 46.- Museum of Science (Cosmocaixa). 23.- Barcelona Zoo. 48.- Monastery of Pedralbes. 24.- Cathedral of Barcelona. 49.- Collserola Tower. Zoo or aquarium. Museums, historic building, Gaudí, and so on. Monument or important area. Religious monument. Related sports. Related Futbol Club Barcelona (Barça). If you detect a failure or modification, or if you can help us to improve the English translation please, send us a message and we will fix it. Thank you very much for your visit, we hope that was helpful to our tourist map of Barcelona.